This is the time of year when the last brood of Monarch butterflies is stoking up for their long journey to Mexico. Asters and goldenrods are the principal nectar sources, but by now most of them have stopped flowering. 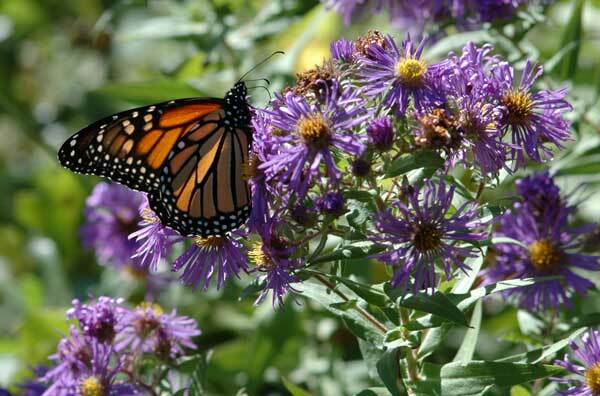 Fortunately, New England aster is still flowering and this is what the Monarchs are using. Often considered a weed by purists, it has the good graces to hang on longer than anything else. 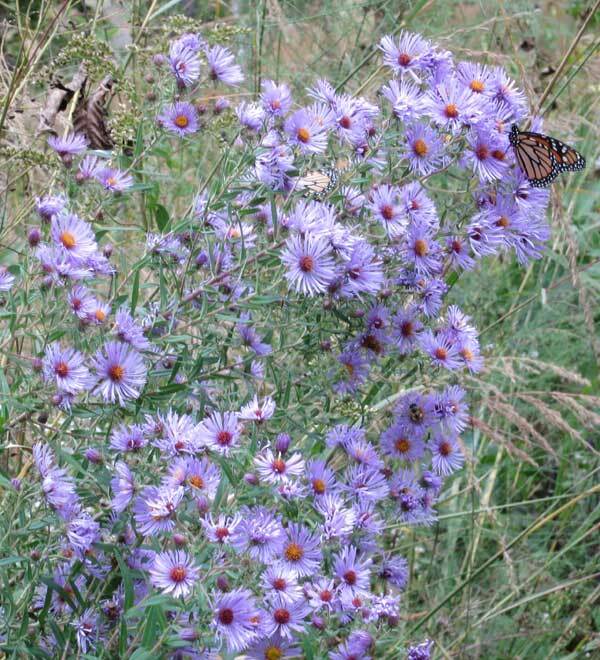 A few years ago at Pleasant Valley Conservancy a butterfly watcher about this time of year counted 43 Monarchs on a single NE aster plant. 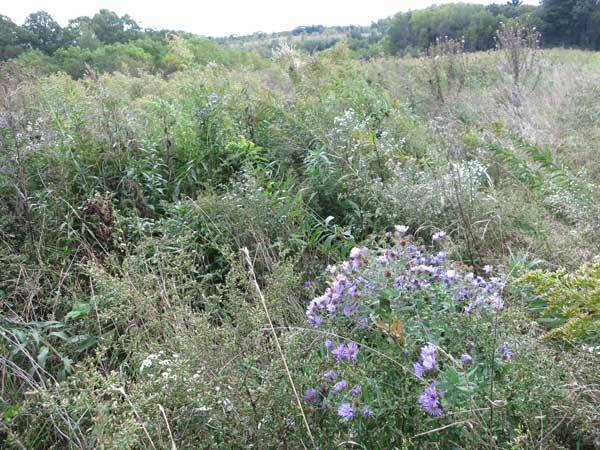 Although both of the above photos are from restored savannas, you can find New England aster as a volunteer in old fields and roadsides as well. 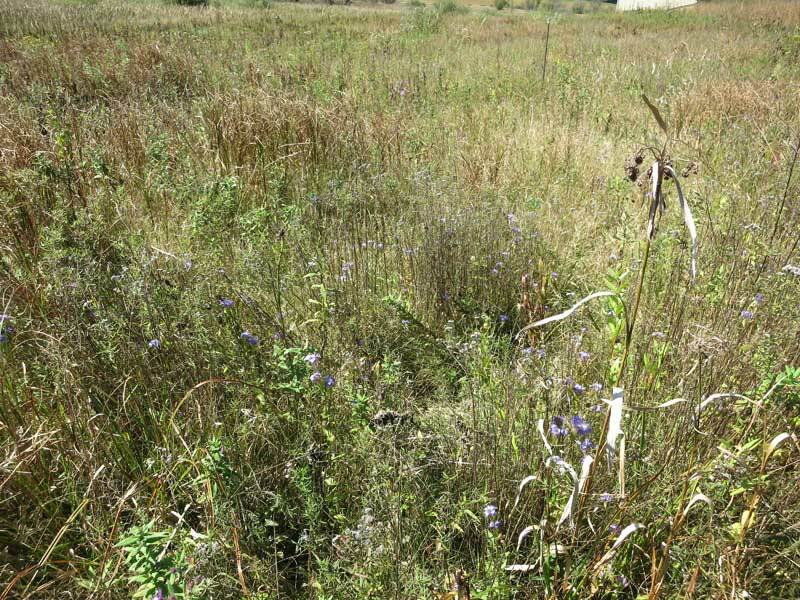 I've been watching one of my neighbor's fields since it was last cropped four years ago and have been fascinated at how quickly "weedy" prairie species from PVC have moved in. Last year it was old field thistle that had moved in. See this link. This year it is New England aster, as the photo below shows. New England aster growing in an old field adjacent to PVC that is gradually being colonized. Two plants of old field thistle can be seen in the background. The seed source is our East Basin prairie which is about 100 feet away. This field has been fallow for only four years. The small white flowers are probably frost aster. The goldenrod is (predictably) Canadense. The famous and even rarer Great Plains fringed gentian (Gentianopsis procera; Special Concern) is the species found at the Ridges Sanctuary and other locations along the Door County beaches. Right now, at PVC we have in flower all four gentian species from the above bullets: stiff gentian (widespread); bottle gentian (well established in the Crane and Valley Prairies); prairie gentian (in the Ridge Prairie), and fringed gentian (the marsh/fen edge near the barn). 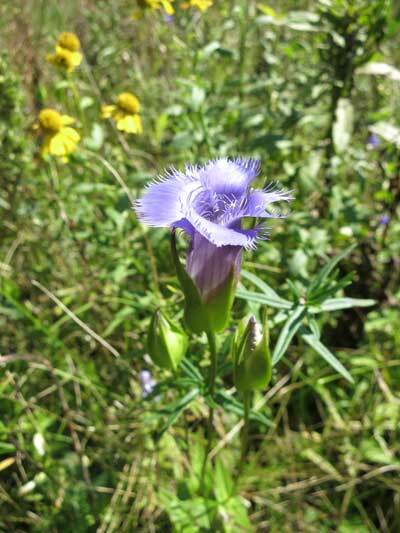 Stiff gentian was native to PVC but the three others were planted from local genotype seed. It is the fringed gentian that interests me here. Over the last 3-4 years we have been able to get this handsome species well established in the wet-mesic prairie near the barn. Ten years ago this wetland was a solid monoculture of Carex trichocarpa, but then I discovered that lousewort (Pedicularis lanceolata), a hemiparasite, could infect the sedge and keep it in check. We started throwing out lousewort seeds. Gradually, as the sedge disappeared,numerous other wetland species became established. The bottle showed up first, but in 2014 we had our first fringedgentian flowers. Since fringed gentian is a biennial, continued presence at a site depends on good seed production and subsequent germination and growth. The area we chose must be favorable because this year we have dozens of flowering patches. Tyrian is a type of “purple”, Royal purple. The color would not appear until frost had arrived. 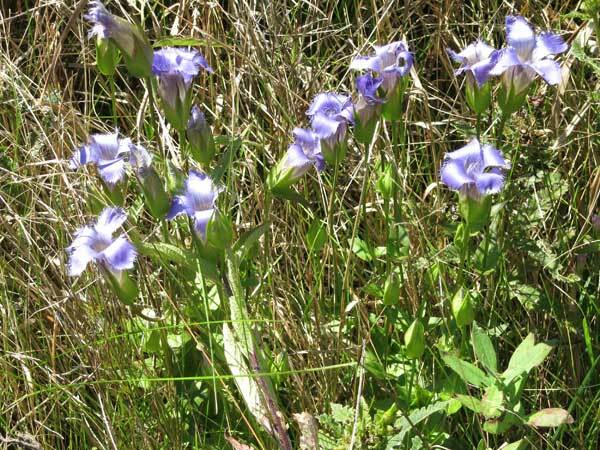 The internet is full of fringed gentian lore. Indeed, there is a Gentian Research Network at Rutgers University. Fringed gentian habitat at PVC. Visible from the lane next to the Valley Prairie. This time of year, most of the other wet-mesic species are finished blooming. The report below was written on Sept 23. Since then, lots more trees are showing symptoms of bur oak blight. Many are large trees, including some icons. I am hoping that the unusually humid weather this year is responsible, and that no long-term damage will befall our bur oaks. We'll see what next year brings! I first reported bur oak blight in a small number of trees at PVC in 2017. Infected leaves exhibit purple-brown lesions along the veins on the under side of the leaves. These lesions gradually expand and in many cases the leaf turns completely brown. Black fruiting structures of the causal agent, the fungus Tubakia iowensis, appear and are diagnostic for the disease. Although not fatal, we felt it desirable to continue monitoring this affliction. The trees that were infected last year leafed out normally, but symptoms started to appear in late August. Yesterday, about a month later, the symptoms were more extensive, although some leaves were still not infected. We also noticed blight on some trees that had apparently been fine last summer, including the classic open-grown bur in Unit 10 that I have often used in photographs. Also, our oldest bur oak, the patriarch of the savanna, does not seem to be infected as much this year as last. But most of our bur oaks, both small and large, remain healthy. Bur oak blight infection is apparently associated with humid weather cycles and the past two years have been unusually rainy. Since long-term weather patterns generally alternate between wet and dry years, we can hope for some drier years (although nothing like the 2012 drought!). Since the symptoms do not appear until late summer/early fall, the leaves on infected trees have most of the growing season to function normally, photosynthesizing and translocating nutrients to the roots. Even now, most leaves are only partially affected. Bur oaks regularly lose there leaves earlier in the fall (usually mid October) than do most other oak species, so it won’t be long before the leaves will be dropping. Thus, there is a narrow window, mostly the month of September, when bur oaks can be monitored for blight. The scientific paper describing this disease in detail can be downloaded from this link.